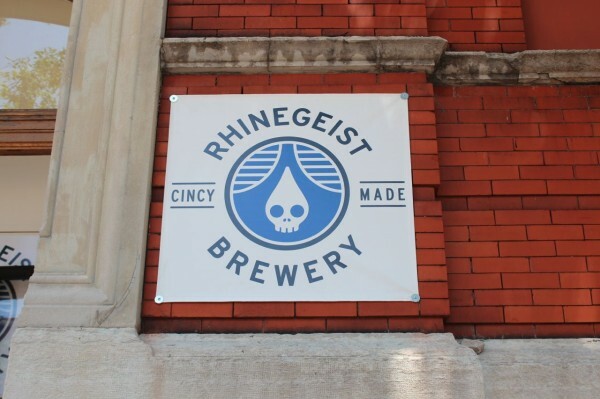 Here we are with another installment of “365 Things to do in Cincinnati” and today we are shining the spotlight on one of our new local breweries – Rhinegeist. 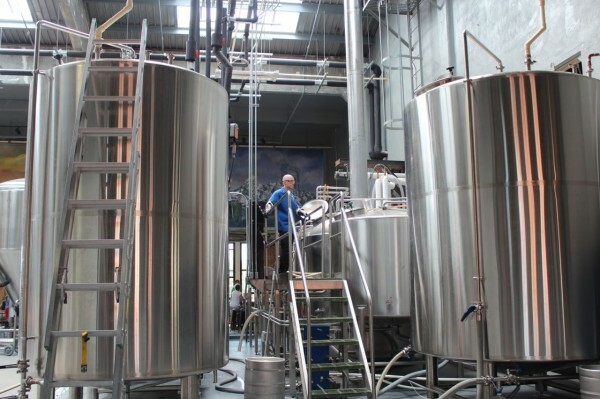 Rhinegeist opened its doors in June of 2013. 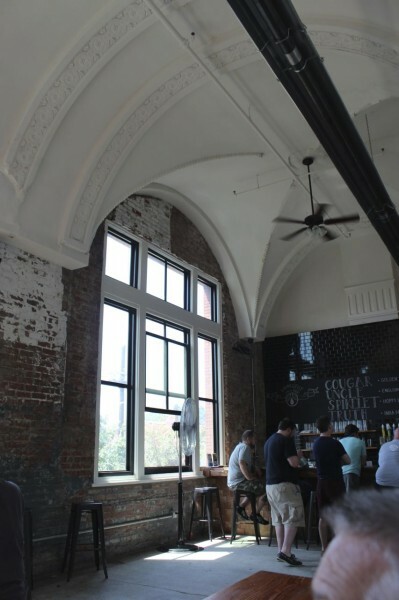 Located in Over the Rhine, the brewery is located in what used to be the Christian Moerlein bottling plant. The space still has a number of its original details and adornments, making you keenly aware of brewing times passed and present. It’s an expansive space and includes lots of room to grow. For now, they’re using their extra space to entertain their guests. We visited on a Saturday and enjoyed a tour led by Bryant, one of the Rhinegeist co-founders. Tours are often available on the weekends but registration is suggested (they cap them at 20 people). You can find out more about tours at Rhinegeist here. We couldn’t leave without sampling the beer (twist my arm). That would just be wrong. So we ordered up a sampler. When we visited they had four brews: Cougar (Golden Ale), Uncle (British Mild), Spikelet (American Wheat), and Truth (dry IPA). 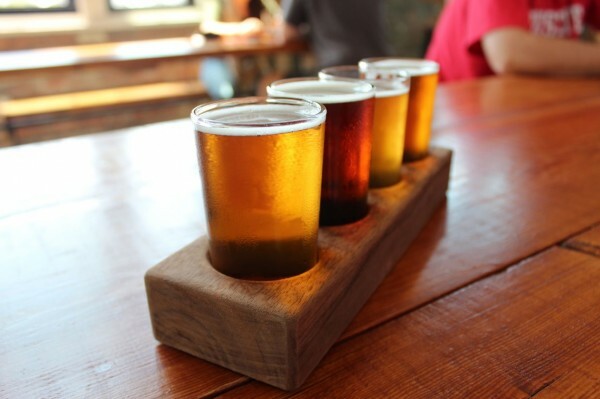 They are offering seasonal brews as they make them. Again, check their site and/or Facebook page for updates. One last fun fact…. See the logo there on their building (above)? I have to admit I was not a fan of that logo until I heard the meaning behind it. When I was talking with co-founder Bryant Goulding he told me this about the name and logo: they are operating in “a haunting old skeleton of a building with modern brewing”. And the name Rhinegeist has similar meaning behind it. Rhine, of course, is in reference to Over the Rhine and geist is shortened from “zeitgeist” which means “spirit of the age”. If you think about all the beer that has passed in and out of that building, the building, its history…. I think you’ll agree its the perfect logo. Love to see all the new breweries & development in home town. That logo will hinder more than that story will help. I could be wrong but the international sign for poison is a skull. Not sure you want to unintentionally miscommunication this great beer & lifestyle with death. Love to stop by for a visit on my next trip up from Naples, Florida to Cincy.